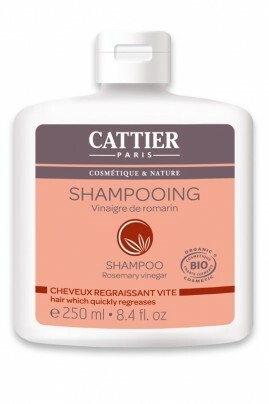 Cattier Organic Shampoo with Rosemary Vinegar deep-cleanses oily hair and scalp due to the action of its Plant Vinegar (Rosemary, Lavender, Sage and Thyme), which removes excess sebum and leaves the hair soft and glossy. Rich in Wheat protein, a composition which is very similar to the keratin proteins in hair, it nourishes and strengthens the hair at its very roots, leaving it easier to comb out. Essential oils selected with the utmost care, have been added to Cattier Organic Shampoo with Rosemary Vinegar to enhance its cleansing properties and to leave the hair lightly fragranced. HOW TO SHAMPOO OILY HAIR ? Apply Cattier Organic Rosemary Vinegar Shampoo to wet hair and gently massage in, produce lather. Leave for a few moments, and then rinse thoroughly with warm water. Organic Aloe Vera, Plant vinegar (Lavander, Rosemary, Sage, Thyme), Wheat proteins, Glycerin (vegetable), Essential oils of Orange blossom, Sweet Orange, Ylang-Ylang, Clove blossom, Rosemary and Eucalyptus. Une renaissance pour mes cheveux si fins et qui graissaient trop vites avec des pointes sèches. Ce shampoing est SUPER ! Enfin un shampoing clean qui fonctionne ! Youpi ! L'odeur n'est pas très agréable mais ne reste pas et le résultat est top.